The CAN-ID used for the CAN Interface like CANGC1(e) and SocketCAN. TCP/IP 10/100 MBPS CAN-GC1e GCA Peter Giling Preferred. USB 500 KBPS CANUSB MERG Preferred by MERG. The 12V version can be used in combination with the CAN-GCA line. RTS/CTS should be disabled because its not supported by this module. 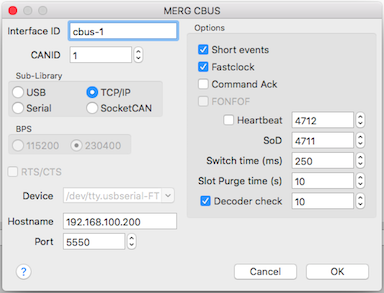 Serial 115200 CANRS MERG Deprecated; It is not fast enough to keep up with CBUS at full speed! SocketCAN - RPi-MCP2515 SocketCAN compatible devices. The serial device used for the CAN interface. The hostname and port for the CAN-GC1e interface. The long events are based on node number and event number. Send fast clock packets on the CBUS. It is recommended to set this enabled in case of using a TCP/IP connection to prevent idle timeout disconnection. Use only in case of data loss in combination with WiFi. Activates the command acknowledgment handshake. A next command can only be send if the interface did acknowledged the previous command. Other manufacturers, like Lenz, are also using such a handshake on there Ethernet interfaces. Only the CAN-GC1e version 1.c is capable of handling this acknowledgment when this option is activated in the firmware. Sends every second an event# 4712 OPC_ACON/OPC_ACOF on the bus to be able to check for hardware/cable problems. The LEDs on the modules should flash every second. A CAN-GC2 can be programmed on this event# to be able to add a LED mounted on the dashboard. "Start of Day" address for query all input states. This must be programmed as event in all input nodes which should report. CS timeout for updating DCC mobile decoders. If a loco becomes idle before this time out a keep alive command is send to the CS. The hardware purgetime is 20 seconds, so this value should be set to less then 20 to assure the slot is not purged during automatic runs! Loco sessions will be invalidated if the GC3(CANCMD) was lost. mergCBUS addressing is FLAT, only the bus and address values are used. - CAN ID 0…127 Unique number within a CAN segment to be used in the CAN transport layer. This is the low part of the CAN Message Identifier without priority bits. Bus Node number 0…65535 Used for long events and programming. This must be set unique for all modules. Gate Added to the address of output objects. 0,1 This is needed for signal pattern support.